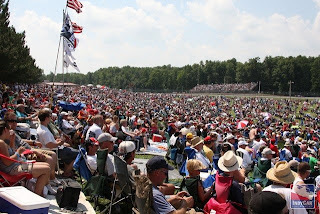 - Great crowd at Mid-Ohio; everywhere the cameras roamed there were actual, honest-to-goodness spectators, unlike say Watkins Glen. And a traffic jam leaving the track. - Another nice run from Paul Tracy filling in for Mario Moraes. - An even better quote from the aforementioned Paul Tracy on his blog: "But at least I didn’t make mistakes; some of the big-money players like Helio drove through the gravel traps, so they ended up getting beaten by the 40-year-old driving for hamburgers." If we can't get this guy in a full-time ride, at least put him in the booth. - Not as much of a snoozefest as the recent road course extravaganzas, although most of the action was in the middle of the field. - +2 cars for the 2010 grid, as Gil deFerran and team manager Robert Clarke announce plans to add a two car team. - Another strong showing by Ryan Briscoe, who is looking more and more like a robot or at least a clone. - Dario Franchitti was notably a step off the pace all weekend, but still scored a podium finish. And at Mid Ohio, they actually HAVE a podium. - Ryan Hunter-Reay had a very strong showing for AJ Foyt Racing, and was THE mover and shaker early in the race. “I put it together on the track and the guys put it together on pit lane and that’s what it takes. We didn’t make any mistakes. A lot of guys that are making a lot of money—veterans--made a lot of mistakes today so it’s awesome for ABC Supply and A.J. And a big thanks to ABC Supply for their support.” Note to Ryan - it might be time to update your website landing page pic, since those ethanol direct deposits are no longer arriving at the bank. - Dixon came as close as any driver in recent memory to lapping the field on a road course. 29 seconds? N-word would have at least thrown a phantom caution for debris. Or three. "The Target car was great from the get-go." "Obviously it's a fantastic milestone for myself and obviously for the team. I've achieved all of those wins with Target. Without them, it wouldn't have been possible." "I don't really care for leading the championship now. The only time you want to lead it is at the end. If you can get a runaway now and start building some points on those guys, that's going to be important." I'm not saying Dixon has to run the track naked after winning (a la Patrick Carpentier), but two interviews after the race showed he could even use press interaction training from a rookie like Joey Logano. - Apparently the push to pass, Honda Power Assist Button or whatever they were calling it this week, is now being used defensively to prevent passing. Give them lemonade, and the IRL will try to turn it back into lemons. - Not much of an impact by Robert Doornbos move to HVM. Or maybe Bobby D isn't as good as the hype would have one believe? - Another so-so outing for AGR - with Hideki Mutoh and Marco Andretti finishing fifth and sixth respectively, despite being invisible all afternoon. TK was 10th and Danica 19th. Big three status is hereby suspended until AGR can actually challenge weekly. - Was Dan Wheldon (16th) even on the track? - Okay, we got it in the first 38 mentions - the Rahal family is from Ohio and thus love the track. See how easy that was? - Do we start with Mike Conway hip-checking Danica into the kitty litter? Is the Conweasel going to have another race without incident in his IRL career? And why are we still talking about his IRL career in the present tense. Team owner Robbie Buhl's embarrassment oozes right from the TV speaker weekly. - Not much competition for Scott Dixon once Justin Wilson had his pit problem. Wilson magnified the issue for small teams in the IRL 2K9 - not only do they need to drive the bejesus out of the car, but also have a mistake-free day in pit lane to even have a prayer of unseating the red cars. I agree with Paul. Expectations on road and street courses have become so low this does not rate a "snoozer" description. How do we know "most of the action was in the middle of the field?" I didn't see it. Lap chart didn't seem to show it. In all fairness PDog, that's more of a VERSUS problem though surely? That race was a snoozer - with some exceptionally badly timed commercial breaks by our friends at Versus causing us to miss the few moments of drama in the race. PT definitely needs a full time ride - he is entertaining and drives like he wants it! Where was Scheckter this past weekend? Milka was in the other D&R car, and we all know how that worked out. I love Scheckter, he's like a poor man's Paul Tracy.